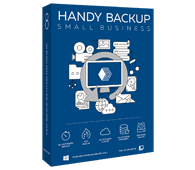 Handy Backup is a perfect NAS server backup solution for small business and home, allowing using NAS as both source and destination for Windows NAS backup. Any edition of Handy Backup has capabilities to use it as an effective and reliable NAS backup software. Complete control over NAS server backup, including full, incremental, differential and mixed backup, as well as rotating NAS backup versions, making compression and encryption, silent running and so on. These features allow you organizing and automating all backup operations involving your NAS(es). Newest versions of Handy Backup support both Windows and Linux in native mode. Now you can install a Linux copy of Handy Backup on your Linux-based NAS and run it locally in a fully native mode, requiring no bridge software to utilize all its functions! 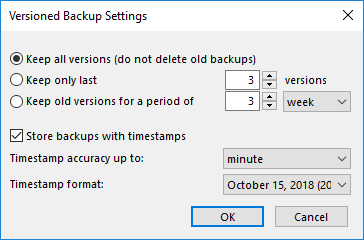 The easiest way to automatically back up important data to NAS is to use the Handy Backup Small Server edition of our software. Free 30-days trial version! “Black-box approach”: You can use NAS as a mapped drive, or as a shared network resource, finding it by network address. This approach has no requirements for NAS software or configuration, although it links all NAS backup operations to an external machine. “White-box approach”: You can install Handy Backup to your NAS (if it has any edition of Windows as the OS), or use the Network Agent for network editions of Handy Backup (available for both Windows and Linux OS). Handy Backup becomes a part of your NAS software. The second approach requires some skill to install Handy Backup on your NAS. As an advantage, it allows redirect some or all of your backup operations to the NAS (very useful if you plan to schedule your backups on a regular basis and do not have a server mainframe in your network). How to Back up Your Data to Your NAS with Handy Backup? As compared to DAS (direct-attached storage, such as USB external hard disks), a NAS device has two big advantages. This section illustrates the “black box” approach when using Handy Backup as NAS backup software. To keep your dataset on a NAS connected to your network, please use the following sequence of actions. 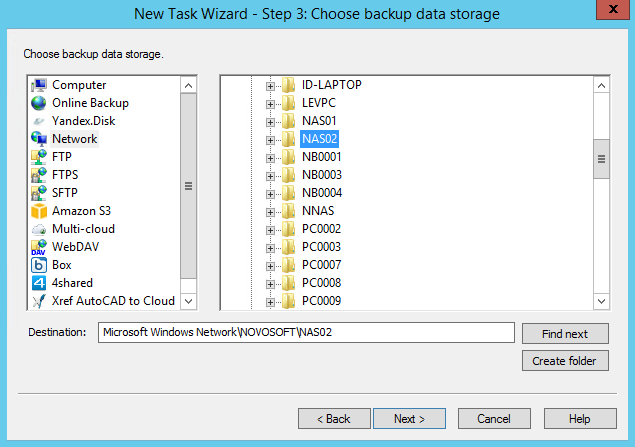 Choose the backup task type. Go to Step 2 and select data you will save to your NAS. The list of data source options is explained in the User Manual. Proceed to Step 3 and select “Network” as the place for your data copies. On the right side, choose your NAS by name. Select a particular folder within your NAS file system if you need. 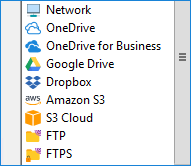 Note: If you have your NAS mapped as an external disk, use the “Computer” destination feature instead of the “Network” feature, and select your NAS by name and/or drive letter. Then set up all other task parameters as shown in the User Manual for each of remaining steps in the task creation wizard. Name your task and run it (or schedule running by time). To get a personal experience using Handy Backup as home or small business backup solution with your NAS backup server, please do not bother to download a 30-days completely free trial version! Handy Backup resolved my backup problem - backing up an NAS raid to a USM attached drive. Could not find another product to do that.